In recent years, Muslim women are challenged on finding good quality Islamic clothing that are both stylish and affordable. Fortunately, in today’s contemporary world and the rapid expansion of online businesses and internet focused media, there has now been a plethora of choices for Muslim women especially with regards to exceptional clothing. Accessibility to such fashion has become much easier than ever before. 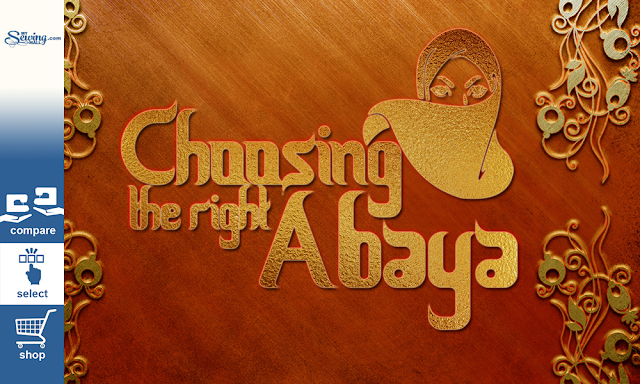 The wide variety of choices of Abaya nowadays can be overwhelming especially for first time buyers. Many online boutiques and stores have contributed to the ever-growing selection of Abaya available. Even with assistance from articles from known Islamic style reporters and bloggers, picking the best Abaya can still be quite a handful. It is rather common for women to follow their impulses. Shopping is no exception, in fact most women tends to purchase products that they are attracted to, only to find out soon that it doesn’t quite match their preferences and style. Most of the times the design and material is to blame, but at times it is because that women didn’t give much thought before making the purchase. - Will this flatter my shape? - Do the colors suit my complexion? - Is there another option that better suits my shape and size? 2. Order the perfect size for a perfect fit. This scenario surely has had happened to thousands of online shoppers already, it’s a frustrating thing to experience. Best way to avoid this is to ensure that you are ordering the right size for your fit. Most online boutiques have a separate page on their website where they provide further detail about sizing options. Carefully examine these before picking your size, sizes may also vary depending from where the website originates. Size 10 in UAE may be different from size 10 in US. Many Abaya design houses will rely on a sizing guide that is determined by the actual Abaya length and not by body size, especially Abaya designers from Dubai and surrounding gulf areas. Whenever you see a size 50 in Abaya, it is probable that it is pertaining to 50 to inches in length, which tells you if you will be covered from head to toe. Although a few Abaya manufacturers do provide custom sizing, most don’t and instead offer a selected range of sizes. It is very important to know your own body measurements – specifically the bust and garment length when it comes to Abayas. Knowing your measurements may just save you the hassle of having to return purchased goods through the post! 3. Read and check the label. Purchasing an Abaya based solely on how good it looks is critical. Most companies provide information about the product, it is important to read and check the details and facts about the product before making any purchases. Keep in mind that some companies offer Abayas that are suited for certain climates. Gulf based companies tend to design Abayas that are suited for summer climate, which can be worn for all seasons. 4. Purchase from reputable companies. The majority of companies are very professional and prompt in terms of product quality and customer service. It is important to consider the company’s background and experience in making quality Abayas. You can easily determine the reputable from those which are not with just a few clicks. Doing research online can provide reviews detailing product reliability and quality. Browsing the company’s social media platforms like Facebook, can also provide relevant information regarding the company. Satisfied customers are most likely to leave positive reviews and comments on their page.